In 2015 I have a yen to enjoy December. To approach the month as a leisurely stroll rather than as record breaking laps for the Grand Prix. I'm going to pace myself by spreading the frenzy evenly across the weeks and cut myself some slack by having a few 'no Christmas days' each week. On these days I'll pretend it's May and make daisy chains (or the winter equivalent). I'll watch Mamma Mia! instead of White Christmas and sip rosé wine instead of mulled wine. Bravely, I'll knock my procrastinating perfectionist nature on the head by being adequately organised and get the essentials done early. Unfortunately, Instagram will have to wait another year for my styling sensations. There's still lots of Christmassy things I'm looking forward to but I'm not going to worry if I miss a few. A few less decorations, sausage rolls and renditions of Fairy Tale of New York (which used to be my favourite Christmas track before it was overplayed) won't dampen my spirits. A little Christmas restraint will, I hope, mean that I have the time and energy to savour the joy and quiet of the season. Christmas Day might possibly be more meaningful for it. December. 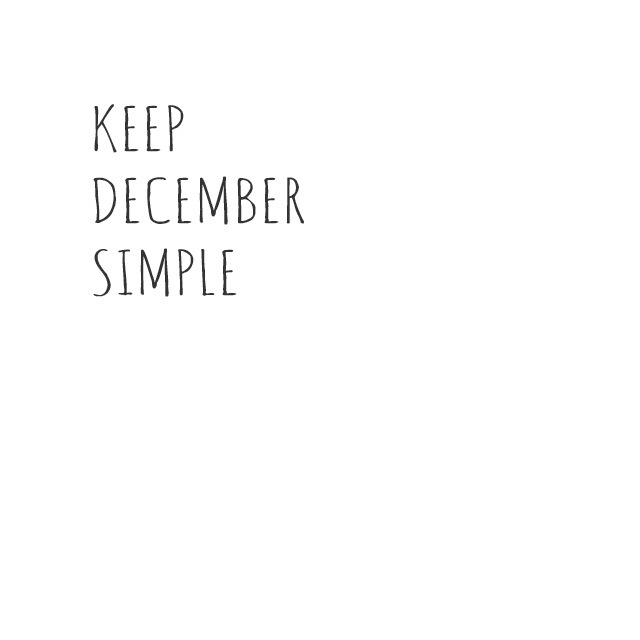 What better month to simplify. I agree! No better month--not better time--to simplify than NOW! Im going to read this post once a week during December to remind myself of this simpler, better approach to the whirl that is holiday season. Gail. I enjoyed this post, I too, am aiming to simplify Christmas so that I have time to 'enjoy' this time of year. This year I will be purchasing my Cake, Pudding etc. instead of spending my time making them. I used to work with a lady who made 20 puddings each year for gifts, but left all the work until December - she was always stressed out for Christmas!! One year she gave me a gifted pudding, although this was extremely kind of her, if I'm truthful it was just as good as the 'bought' pudding we had. I've made the decision to try and cut corners when it comes to the food side of the season. I'd love to hear if you have any tips to simplify your cooking/entertaining over Christmastime. I enjoyed this pose. We too will be simplifying this Christmas. We are downsizing, moving house in January and have to pay Surveyors fees. Christmas holidays will be spent chilling, decluttering and packing.